Baby Mall Online, a division of BabyVision Inc., launched in 2005 with the mission to offer families with newborns the best soft infant care products at value prices while providing our guests great service and low shipping costs. BabyVision, Inc started with a Playskool® licensee by parents with a determination to deliver better value, diversified product offering and safe baby care products to parents and caregivers around the world. 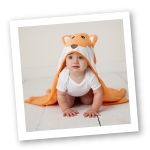 We offer an extensive line of products today, including baby clothing, bath, bibs, blankets, feeding, gift sets, socks, shoes and travel accessories. In 2014, we are enthusiastically launching our newest brand, Yoga Sprout, featuring fun, comfortable athletic wear with vibrant colors and playful patterns. The line features adorable fold-over Yoga pants paired with coordinating hoodie, bodysuit, caps, bibs & blankets. We are truly excited to offer moms fun, differentiated and innovative Yoga inspired products for their newborns and will continue to grow the offering with creativity. We stand behind the quality of our products. We strive every day to offer caregivers products with adorable artwork and designs that are durable and comfortable for their baby. Our goal is to meet the needs of moms and their newborns by providing reliable and trusted brand-name products at a good value. Each guest is valuable to us, and we want to be your first choice for all your baby’s needs. We believe that every baby deserves the very best. We are dedicated to offering quality products at affordable prices so you can focus on what really matters – caring for your little star.